A few final thoughts on how harnessing the entrepreneur within each of us is critical to the road to happiness. As I mentioned in my last post, very significant research has been written regarding successful entrepreneurs. One acclaimed research article discusses why some people discover entrepreneurial opportunities and others do not. The answer is not blind luck. The research indicates that the answer lies in the possession of prior information gleaned from previous experiences as well as the cognitive properties to value to opportunity to go or not to go forward. These cognitive properties involve the ability to evaluate the costs of lost leisure, the capital required, and the premium associated with uncertainty or risk. Once we have made it through the involvement and exposure stages of life, having developed a strong self-esteem, we must then use our prior information earned from previous experiences to perform an analysis as to whether it is wise to move forward and accept the adventure (or the opportunity that is before us). Like the successful entrepreneur, this decision takes wisdom (cognitive properties), prior training (prior information), and courage (self-esteem). Also, like entrepreneurship, one can move forward and accept the call but later fail in the adventure. The forces of life could simply be much stronger than anticipated (or for the entrepreneur the competition could be unexpectedly fierce). Fortunately, again as with entrepreneurship, the individual can regroup and begin a new adventure having learned from his/her mistakes. Also, like entrepreneurship, one can move forward and succeed in the adventure. As with the successful entrepreneur, the wealth of happiness is earned, and society, to a small or large degree, soon flourishes from the boon or gift that was secured during the adventure. Not a bad place to be!! This entry was posted in Uncategorized and tagged entrepreneurial traits, happiness on January 17, 2014 by oliver. It is worth mentioning that the attributes of successful entrepreneurs that I mentioned in my previous post, as well as my book, are not just characteristics of the mass market or popular media. These attributes are ones documented in recent academic publications, the publications themselves based on rigorous academic research. In fact, the research studies go to great lengths to differentiate successful entrepreneurs from unsuccessful entrepreneurs. Unsuccessful entrepreneurs are those whose ventures never succeed from the beginning or fizzle out within a few years; thus, they don’t survive beyond 3 to 5 years. The main differences between the two are: 1) education/training, 2) social skills, and 3) willingness to act today on opportunities that will offer a future that might be lived above expectations. These three attributes are also necessary for achieving happiness. And, these characteristics involve a degree of luck and a desire to take on risk in one’s life. The assumption of risk leads to the self-esteem needed to recognize and capitalize on opportunities that will lead to happiness in the future. The education/training will provide the means to make sure that the opportunities are successful down the line. All the risks, if undertaken properly, will offer the best chance of gaining happiness in the future. This is not an easy road: but then if the road were that easy, happiness would not be much of a prize. And, as all the great thinkers and artists have expressed, what a great prize it is! This entry was posted in Uncategorized and tagged entrepreneurial traits, happiness on January 13, 2014 by oliver. In my previous post I discussed how the fine arts provide a third dimension of experiences to the two dimensional triangle of the “prose” of the great thinkers. This three-dimensional pyramid contains all the necessary ideas and art to understand and experience the requirements for traveling the road to happiness. However, there is one final dimension missing: the vehicle for traveling the road. How do you get to the top of the pyramid where happiness if found? You can read the works of the great thinkers, and you can experience the human feelings through the works of the great masters of the fine arts. 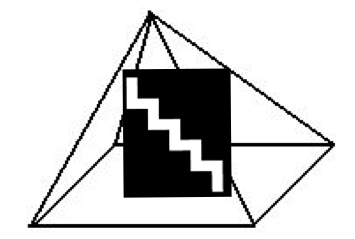 But you need a vehicle for traveling through the pyramid and upward to the apex. This vehicle is the entrepreneur within each of us. The entrepreneurial instincts that we all have must be harnessed if we are to reach happiness. This includes social interactions (what I call “involvement” activities) and enhancing our self-esteem earned through many different risky activities (what I call “exposure” activities). Embracing this activities, encouraged by flow (which distances us from our everyday existence), complete the journey segment of our road to happiness. More importantly, we must trust our entrepreneurial instincts at the end of our journey and consider the adventure that follows. Like all entrepreneurs, we must be willing to exploit opportunities in life that others do not see so that our future will be lived well-above today’s expectations. In addition to seeing these opportunities, gained through wisdom earned during our journey, we must be courageous to accept the adventure. We must then remain humble and modest during our journey, and near the end of the adventure, we must be concerned with the well-being of our family, community, and society. Harnessing these entrepreneurial instincts will take us up the staircase within the pyramid: first by way of a journey of “involvement” and “exposure” and then by way of the adventure, if accepted. And the adventure could not be completed without the virtues of wisdom, courage, temperance (moderation), and justice. But one remaining step is needed to reach the very top of the pyramid. This entry was posted in Uncategorized and tagged entrepreneurial traits, Fine art, happiness, Philosophy, self-fulfillment on November 11, 2013 by oliver.